Bei der Europameisterschaft in Mailand war Pawlik trotz einer Blinddarmentzündung sowohl in der Pflicht als auch in der Kür die Nummer eins vor Alena Vrzanová aus der Tschechoslowakei. Im Herrenbewerb ging der EM-Titel ebenfalls nach Österreich (an den Olympiadritten von St. Moritz, Edi Rada). Bei der WM in Paris hingegen brach Eva Pawliks Absatz des Schlittschuhs beim Einlaufen zur Kür. Pawliks Bitte um zehn Minuten, um sich in den geborgten Schuhen einer Kollegin auf ein geändertes Laufgefühl einstellen zu können, wurde vom Preisgericht abgelehnt. Die Vize-Europameisterin Vrzanová aus der Tschechoslowakei konnte also ohne nennenswerte Konkurrenz den WM-Titel erlaufen. Die Ursachen des gebrochenen Absatzes wurden nie geklärt. Um ihre Eltern finanziell unterstützen zu können, unterschrieb Pawlik einen Vertrag bei der Wiener Eisrevue und war damit auf Grund des damals strengen Amateurparagraphen in Hinkunft von Welt- und Europameisterschaften ausgeschlossen. Auch die Beschwörungen Karl Schäfers, wenigstens noch ein Jahr Amateur zu bleiben, um Weltmeisterin 1950 zu werden, konnten sie da nicht umstimmen. 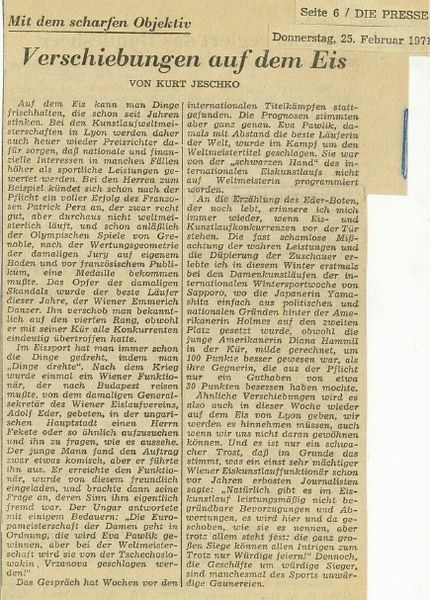 Eine Entscheidung, die möglicherweise falsch war; vor allem auch deshalb, weil im Dezember 1949 ihr früherer Eispartner Rudi Seeliger aus russischer Kriegsgefangenschaft zurückkommen sollte. Mit ihm hatte Pawlik Jahre zuvor einige Jugend- und Juniorenmeistertitel gewonnen und das ungarische Paar Kekessy/Kiraly (die 1949 Weltmeister wurden) besiegt. Die Chancen im Paarlauf wären also ähnlich hoch gewesen wie im Einzellauf. 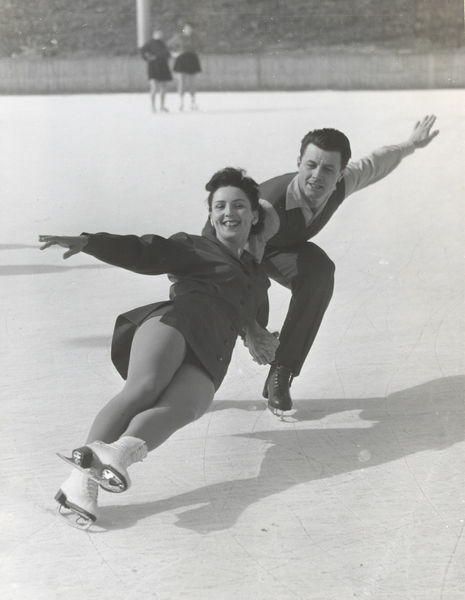 Pawlik beat her rival, the same year´s World Champion Alena Vrzanová, in both school figures and the free skating in Milan to become the 1949 European Champion. At the 1949 European Championships in Milan, Eva Pawlik suffered acute appendicitis. Nevertheless she beat her first competitor, Alena Vrzanová, both in compulsory figures and in the free programme. After her free programme, she had to go to hospital immediately. It was perhaps the most wonderful day of her amateur career. To be first despite the illness proved her to be Europe´s best figure skater by far. As there was no dangerous competitor for Pawlik from outside Europe, that meant she was also the world´s best figure skater in 1949. In the World Championships, Eva Pawlik ranked only second after school figures. But the difference in points between Pawlik and Vrzanová was narrow, so Pawlik was still the favourite. Her strength had always lain in the free programme. At the 1948 Olympics, for instance, she had only been 3rd after the school figures (behind the later Olympic Champion Jeanette Altwegg). It was the free programme that earned her the Olympic Silver Medal. 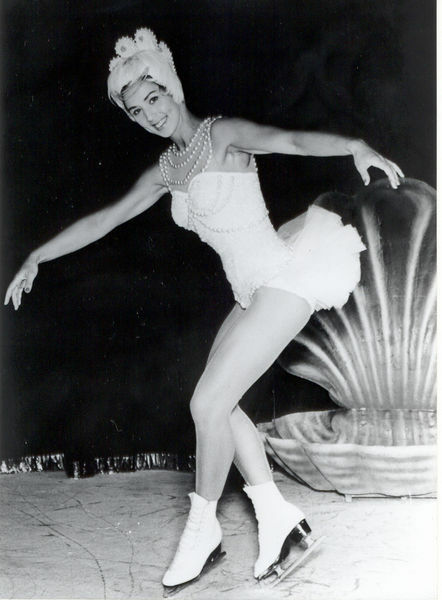 When Eva Pawlik and her competitors were warming up at the 1949 World´s, one of her heels broke. The judges did not allow her to try the shoes of a companion to get familiar with a new feeling of skating. Sabotage was supposed but not proven. As a result of the shortages in Austria, Pawlik unfortunately had no second pair of skates, so she could not compete in the free programme. That was the geatest disappointment in Eva Pawlik´s career. Vrzanová went on to win. In an article from the Life Magazine (14th March 1949) you can see a happy Alena Vraznova having won her first World title and a sad Eva Pawlik. "Favored to win she was forced to withdraw when her skate was torn loose from the shoe." If the broken heel of Eva Pawlik´s shoe really was the result of sabotage that was by no means Vrzanová´s fault. A supposed saboteur could only have been someone behind the curtain who need not necessarily have belonged to the Czechoslovakian community. It could have been anyone. "Miss Eva Pawlik of Austria, the European champion and the favorite here, had to withdraw from the competition. One of her skates pulled loose from the shoe and it couldn´t be repaired in time." It is true that Karl Schäfer implored her not to turn professional but to take part in the 1950 European and World Championships. In the 1990s the ISU Historian, Mr. Benjamin T. Wright, wrote in a retrospective letter that Pawlik was "for sure a better skater than Vrzanová". If Eva Pawlik had known that Rudi Seeliger would come back at the end of 1949, she would have heeded Schäfer´s advice. She had known that she would keep her chances alive not only as a single skater but also as a pairs skater. The chances in pair skating were as good as in single skating because the international standard in pair skating was not extremely high at that time. Besides, there were no school figures in the pairs´ competitions, which would have made things easier for Eva. "(...) I have to agree with you that Eva (Pawlik) should have continued another year in the then amateur ranks, as she was a better skater than Vrzanová and probably could have beaten her in 1950. The British (Jeanette Altwegg), Canadian (Suzanne Morrow) and American (Yvonne Sherman) challengers were not strong free skaters, which is where Eva excelled, although in the tradition of the Viennese school, she was excellent in figures. Here in the States at that time, we all knew she was the principal "threat" to Barbara Ann Scott and the number one after Scott turned professional. Karli (Schäfer) was indeed right when he urged her (Eva) to stay on. (...)"
Durch den Zweiten Weltkrieg und die Kriegsgefangenschaft Rudis hatten Eva Pawlik und Rudi Seeliger keine Gelegenheit, als Amateure im Paarlauf international erfolgreich zu sein. Allerdings avancierten sie in den 1950er Jahren zu einem der weltbesten Profi-Paare auf dem Eis. Due to WW II, Eva Pawlik and Rudi Seeliger had not had the opportunity to become famous skaters as a couple in the amateur rinks. However, they became one of the world´s best professional couples on the ice in the 1950s.